COLFAX, Calif. – Accusing the advertiser of covertly promoting prostitution, residents have demanded the removal of a billboard on the outskirts of a historic Placer County, Calif., town. 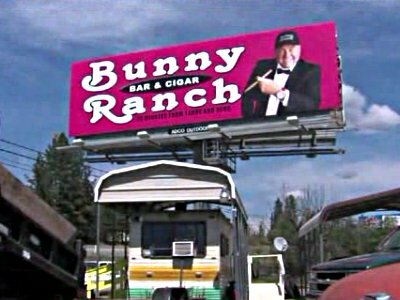 The billboard promotes Bunny Ranch Bar & Cigar, a new establishment in Mound House, Nev., near Carson City. The sign is neon-pink and bears a photo of Moonlight Bunny Ranch owner Dennis Hof, foot-long cigar in hand. Critics say the billboard is a thinly veiled ad for Hof’s primary business: a legal brothel that has operated since the 1950s. While cathouses may be kosher in Nevada, they are not in California. Signs and mass-media advertisements for sexual services are illegal in both states. Colfax residents say the billboard must go. The sign is one of three erected in California as part of a nationwide effort to promote what Hof characterizes as a legitimate eatery located about one and one-half miles from the brothel with a similar name. The City of Colfax cannot do anything about the advertisement in its domain, City Manager Mark Miller told Fox40. Hof is amused by the uproar. Hof erected two similar signs in El Dorado County, just across the county line from Colfax. Community outcry forced relocation of and changes to one of the billboards, he said. The bar-and-cigar operation joins the 46-acre Bunny Ranch Business Park in Mound House. A Bunny Ranch wedding chapel and daycare center are on the drawing board, Hof noted. A similar campaign in near Placerville, Calif., in mid-2013 caused a similar flap. Two of the roadside advertising venues depicted Hof and two scantily clad women. The imagery was modified after the El Dorado County Board of Supervisors discussed taking action. Hof voluntarily removed one of the billboards in August 2013. That hasn’t pacified county residents much, though. “What were we supposed to think he was advertising for?” Nou Eddings asked a reporter for KCRA TV, adding that mothers ferrying their children to school should not have to explain signs like that to their children. “I think [Hof] thinks we’re stupid.